The push button Trimphone was the perfect accessory for an ultra modern home in the 70s. The phone was wedge shaped, sleek and high tech. If you want to own a retro phone today and do not want the hassle of dialling, the push-button Trimphone is the ideal solution. In the 70s the GPO supplied the Press-button Trimphone, as they preferred to call it, at a premium, over the standard dial Trimphone. 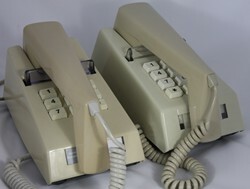 At the top of the range there were leather covered models available, the Deltaphone, in brown leather and the Deltaphone deluxe in red or green leather. Martin Pickering was a young, graduate engineer at GEC's Telephone Division at Aycliffe, County Durham in the 1970s. One of his first challenges was to convert the existing dial Trimphone to ultra hip, push button operation. The problem with the original Trimphone was that the design was way ahead of its time; the 60s' electronics were a tight fit inside the slim line case. The chunky push button dial pad was to be even more of a squeeze. GEC's rival STC could not fit it inside the original case and had to make the phone half an inch higher at the front. It was like a brick in Martin's words. You can see the two phones compared, right. The STC version on the far right is significantly higher at the front of the case. STC phones could also be supplied with 12 rather than 10 buttons. GEC did not want to change the case, for cost rather than aesthetic reasons. It was far more expensive to retool for a different shaped case, than it would be to change the round aperture for the dial into ten holes to take the push-button keypad. Martin's solution was to allow the PC circuit board to bow slightly inside the case. This meant it just about fitted in. In his own admission, it was a cheat, but it worked. There was pressure to get the design finished quickly, because GEC had an order of 100,000 phones to supply to the GPO. All did not go well once the design was finalised. Production workers took five minutes to assemble the wiring loom, instead of the normal fifty seconds it took for other phones. A hasty last minute redesign was needed to get the wiring loom ready for assembly. Martin remembers that after this last minute panic one of GEC's directors always greeted him by name. Was it in recognition of a difficult job well done, or because his design caused so much trouble? Martin doesn't know to this day. The Trimphone was often ordered as a second phone for the bedroom. It was never the most practical of appliances, often being so light that it moved around whilst being dialled. The push-button Trimphone solved this problem. In spite of the slick modern style, the Trimphone was never a favourite with business customers. They were often used only when on show, on the company reception desk for example and famously on ATV's 'The Golden Shot'. There was a special Silver Jubilee Trimphone produced in 1977 to celebrate the Silver Jubilee of Her Majesty Queen Elizabeth II. You can buy both original and reproduction Trimphones today. We sell some very good quality reproduction Trimphones that have push buttons that are arranged in a similar style to an original dial phone. See buy Trimphones from Retrowow. They have the advantage of being more reliable than the older phones, but have a similar look and feel, and a range of fab colours. However, if you want an original Trimphone, follow our guide to identifying a genuine Push-button Trimphone from the 70s or 80s. "In 1969 at the age of 21 I moved into my first new home of my own with my then husband and brand new baby. One of my prize possessions was my blue trimphone. Not everyone in those days had phones but I was determined that a telephone was a necessity for our little family. Everything in my new home came 2nd hand, all except my phone. I can't remember if the base was a slightly darker blue than the hand set or vice versa but the phone was definitely in two shades of blue. If my memory serves me right it was also rented. The rent of which would have been added to my telephone bill. I loved the style of the trimphone and also liked the feel and weight of the handset with long chatty phone calls. I find myself by accident on this site because I am now looking around to buy a replica of a trim phone. Why?? Because at the age of 60 and now retired I am hoping to find a red trimphone to go in my bedroom in what will shortly be my brand new retirement flat. Sadly it will have to be a push button trimphone which to me were/are just not the same as the old dial. But nowadays a dial phone just wouldn't be viable.